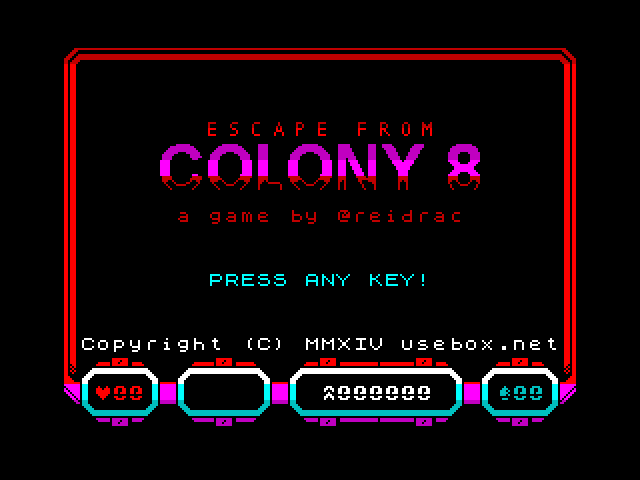 This is a game for the ZX Spectrum 48k (and 128K), and my entry for November in my one game a month challenge. I can’t really tell what happened, when they first attacked our base or where they came from, but Colony 8 is lost. My only chance is to get to the hangar and escape from this nightmare. I just hope my combat suit will be strong enough! The game supports keyboard (keys can be redefined), Kempston and Sinclair joysticks. Default keys are: o, p, q, a and space. Hold fire for some seconds to load a missile (requires ammo), release fire to launch it. Use backspace to exit the game, ‘h’ to pause. Latest release is 1.0 (2014-11-30).